With the summer weather finally here and temperatures predicted to be near the 30s this weekend, time is finally ripe for getting good company together to finally enjoy a drink at the patio. From the ritzy lounges to the gritty dives, Toronto is home to literally hundreds of patio bars, many of which have their own unique features. Yet nothing beats the casual bar with the wide, open spaces and the relaxing atmosphere. So long as the sun shines, the breeze blows and the drinks flow, there’s nothing better than just kicking back and relaxing at a simple patio, with no pretension or care in the world. 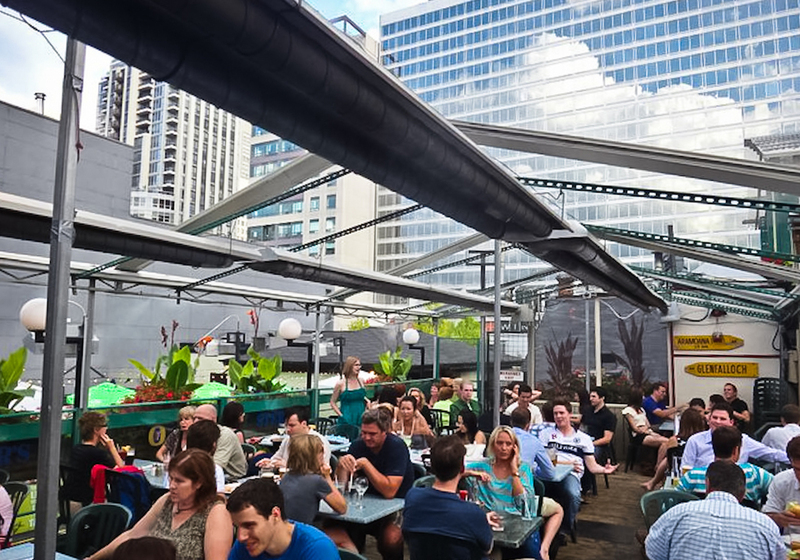 Here are five of the best casual patio bars in Toronto! 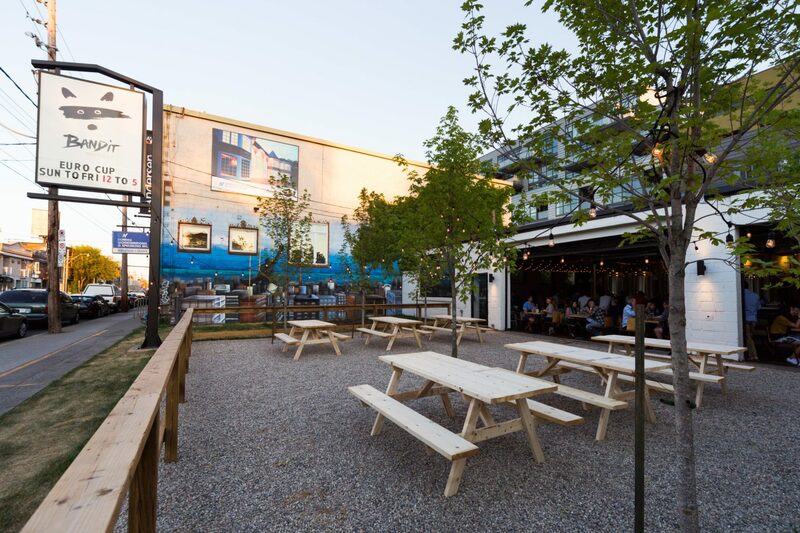 Located in the quiet bustle of Roncesvalles Village, the Bandit Brewery is home to an airy, orchard-like patio with plenty of trees, picnic tables and hanging lights that give the bar a nice, starry look during quiet evenings. Inspired by the relaxing and friendly atmosphere of German beer gardens, the founders of Bandit Brewery really designed a place where everyone from all walks of life can settle down and enjoy a casual conversation. Of course, nothing helps breaks the ice with a little beer, which the Bandit Brewery provides in gallons with over 20 different beers on tap, with at least 15 original home brews! Allen’s – 143 Danforth Ave.
Allen’s has been a fixture of the Danforth neighbourhood for over 30 years and ever since then, it has nailed the simple backyard barbecue look down to a tee. Behind the restaurant is an almost secretive nook that is surrounded by picket fences and shaded naturally by tall, quiet willows. The main selling point of Allen’s is perhaps its juicy hamburgers, which are all made from organic Ontario farmed beef. Combine that with a tall pint and you’ll be set for the summer! Not only is this the type of place you’d want to bring your friends to, but the charcoal grills and cheery atmosphere will probably remind you of home. Hemingway’s – 142 Cumberland St. 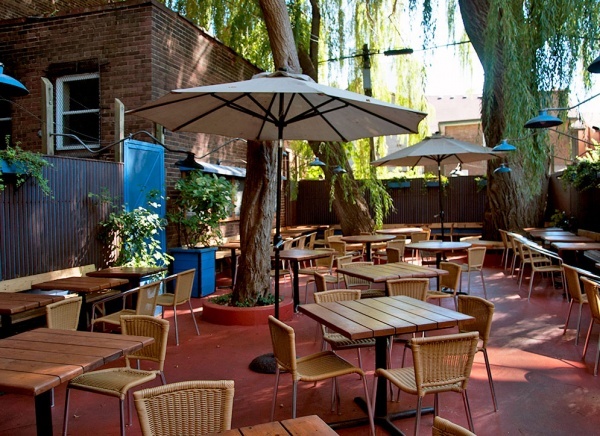 Located smack dab in the sleepless Yorkville area, the patio at Hemingway’s is a rare gem. At first glance, many people would assume this bar as yet another too-ritzy establishment that’s all too common in the area. However, those stepping through the doors for the first time will notice the spacious rooftop patio that radiates nothing but good times and relaxation. With a few levels, the patio at Hemingway’s boasts a surprisingly large space lined with wooden floorboards and hanging lights that draw a stark contrast to the urban jungle that surrounds it. The other selling point of Hemingway’s is probably its easy-going New Zealand theme, which its owner, a bona fide Kiwi, was careful to cultivate. In addition to over 24 draught beers, the menu at Hemingway’s features a number of quality New Zealand wines and mouth-watering lamb dishes. El Catrin – 18 Tank House Ln. It’s tough to stand out in a bar-saturated neighbourhood like the Distillery District, but this place somehow pulls it off. 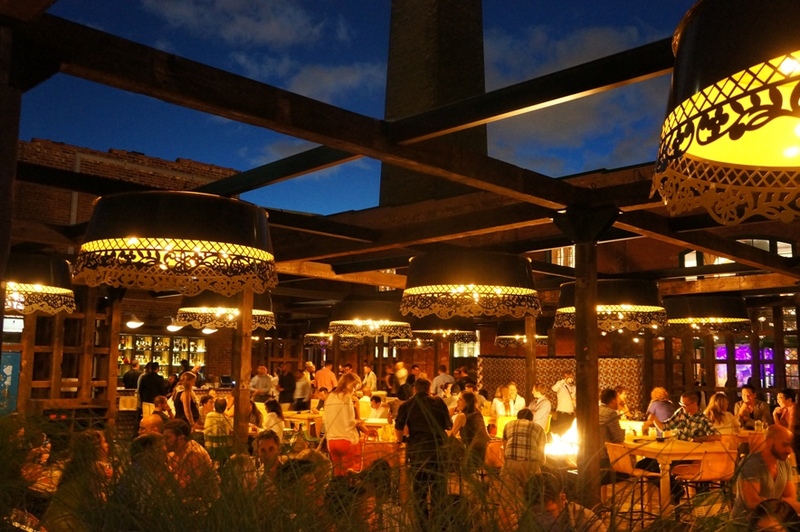 Serving up authentic Mexican dishes and tapas, El Catrin is serious about bringing not just genuine Mexican cuisine to Toronto, but also the real face of its art and culture. While the patio at El Catrin is everything that a bar goer hopes for – a wide, open area with plenty of seats, it’s also decorated with hanging lights, bright colours and murals painted in a traditional Mexican style. Live music plays during evenings, while a large brazier at the center of the patio warms the crowd. In terms of drinks, El Catrin serves up dozens of different types of margaritas, mojitos and cocktails, and is also home to Canada’s largest mescal and tequila bar, which features over 120 different labels! In the summertime, the only thing better than enjoying a drink outside is enjoying a drink outside by the water. Founded by the famous Amsterdam Brewery in 2013, the Amsterdam Brewhouse on Queens Quay was wisely built near the lively Harbourfront neighborhood, which is understandably a popular destination for tourists and locals in the summer. 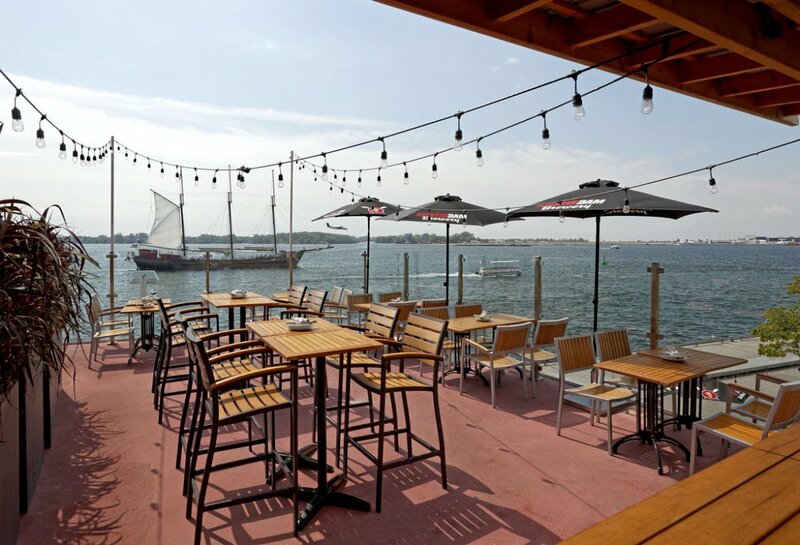 Set up right along the lake is just one of the Brewhouse’s three outdoor patios, which is a sprawling space that features spectacular views of Lake Ontario and the city skyline. Of course, the patio isn’t the only draw to the Brewhouse. The restaurant bar is also well-known for its wide selection of unique drafts and seasonal brews, which can be sampled in many different flights. 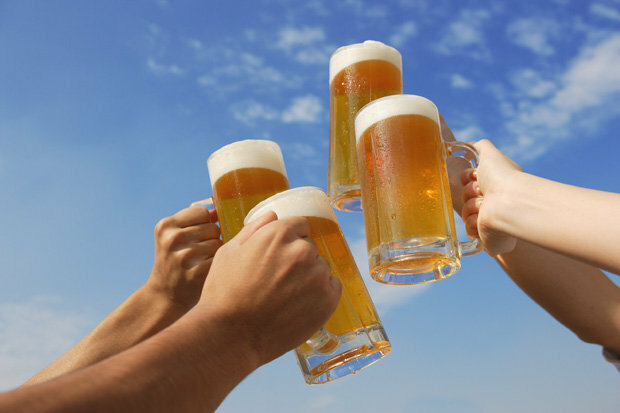 The combination of good beer and lakeside patios is a rare commodity in downtown Toronto, so be prepared for hours-long line ups during the hot summer days!